I found out I'd be going to Madison, Wisconsin for business a few weeks ago. So being the typical food obsessed blogger, I did some research on Chowhound and other resources, and made a short list of restaurants and other eating establishments. Now these type of trips are sometimes a bit dicey, since it means several people sharing one car, etc, etc.... Luckily, I was teamed up with two other really laid back guys, who to a certain extent humored me when it came to eating. During the trip all breakfast and lunches were accounted for, so other than travel days, dinner was the only meal where we had a choice. We flew in to Chicago-Midway Airport for several reasons which I won't go into at this time. And though we arrived at about 4 in the afternoon, due to various technical difficulties, we used the "scenic route" to get to Madison. It was a nice drive, but I think we saw every single corn field between Chicago and Madison. After checking in we headed out and got to State Street around 9pm. After walking with rumbling stomachs for a bit we settled on Chautara. What I found really interesting about eclectic State Street was the variety of restaurant available, everything from African to Thai can be found on State Street or on one of the side streets. This can't be more clearly illustrated than in the existence of Chautara and Himul Chuli. Incredibly, there is not one, but two Nepalese Restaurants located on State Street. Even though it was almost 930pm we were seated by our perky and very friendly Server Liz. After perusing the menu, we made our selections. I ordered the Khasi Ko Masu($17). 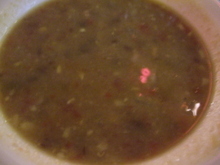 The meal started with a nicely flavored soupy preparation featuring Dal. The flavors were balanced in this hearty soup. 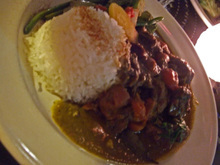 The Khasi Ko Masu is basically a goat curry. 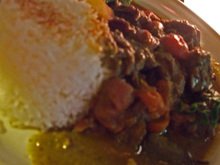 This version was excellent, the goat meat retained some of the nice gamey wild flavor, and was very soft and tender. There was a nice quantity of meat, I'd expected more bones, but there were very few. The flavor of the curry was excellent and balanced, you could make out the ging er, coriander, and other spices, but none of them was overpowering. The tart tomato was a nice foil and provided a nice contrast. To put it simply, this was a very well prepared meal. All of my companions enjoyed their meals. Our Server, the ever smiling Liz was a joy. Being somewhat weary, this was a nice start to our trip to Madison. 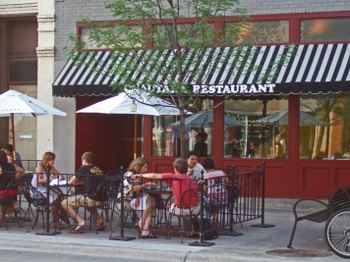 State Street, the lively heart of Madison, features casual and varied flavors. There is one thing you must remember. 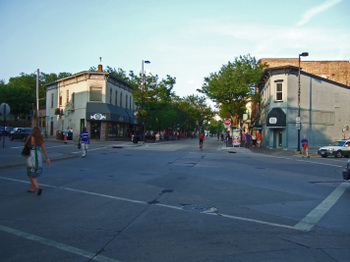 State Street itself is a pedestrian mall. Only Buses, delivery vehicles, and bicycles(and there are many!) are allowed. In other words, don't be like us....nerdy techies using our GPS system(don't you love modern technology?). We took a turn onto State Street. We're driving along, and I notice that while there are many people eating and walking, I notice not a single car! Of course we come to find out that automobiles are not allowed on State Street. I'm guessing that the clueless are many, for not a single pedestrian stared, nor batted an eye...... Makes me a feel much better, that's for sure!